FOR the neutral, the UEFA Champions League final had the required level of drama to capture the attention of even the most hyperactive mind. However, there was something very predictable about Liverpool losing their most important player so early on, you could almost see the steam that has built up under Jürgen Klopp evaporating in front of your eyes. That Liverpool’s hopes were extinguished by a series of unfortunate events was also in keeping with the club’s recent history, notably the Steven Gerrard slip-up against Chelsea that the club’s opponents still sing about today, even after Gerrard has retired and opted for a life of punditry and Glasgow Rangers. Alas, poor Loris, we will never know him well. The young German goalkeeper had a career-defining evening in Kyiv. Distraught after two incredible blunders, his time at Liverpool may not last much longer, the modern game is cruel and unforgiving and his bizarre sling onto Karim Benzema’s foot sent legions of Scousers cowering behind their sofas to shield their eyes from the replay. 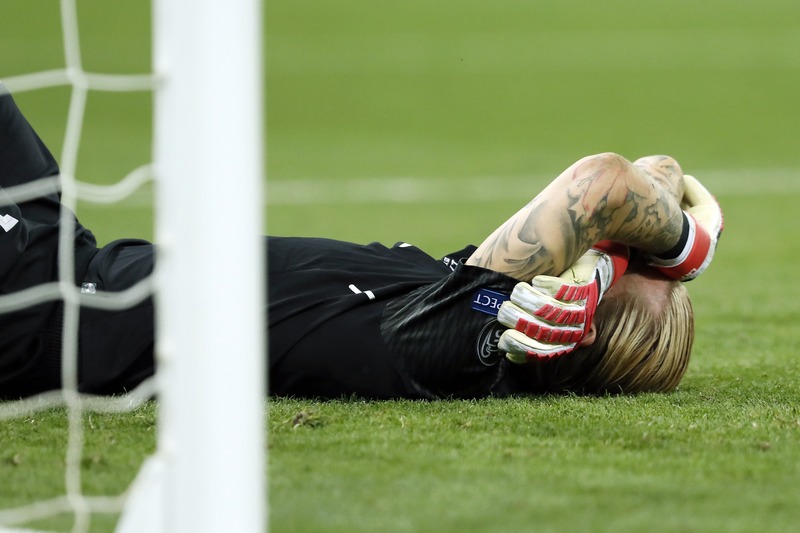 You felt for Karius and hoped it would not be the only goal of the game. But he later had a moment of indecision, not knowing whether to catch, punch or parry Gareth Bale’s long-range shot. It was too hard to push aside and, unsure of his intention, the ball spun into the net after the hapless keeper made contact. Sadly, Karius’s performance will probably become a Frank Haffey moment in time. In between, Gareth Bale scored one of the great goals of all time, certainly one of the best UEFA Champions League final strikes. Bale looked too tall to connect properly, and his posture appeared more tin man than action man, but somehow, he met the ball just right and it sailed into the net. Karius could do nothing about that. The final had its killer goal, one that will hopefully overshadow the goalkeeping errors. Liverpool were, at that point, beaten, shorn of Salah, bereft of confidence and alternatives. Klopp did not have the armoury or ability to dramatically change the game. Real Madrid’s bench gave them far more options and one of those substitutes was Bale. Enough said really. Liverpool have always had a good “A game”, but there was no plan B. You could say that Liverpool are ahead of schedule, but having reached the final in 2018, Klopp has just acquired the added burden of unrealistic expectation. Liverpool had a relatively comfortable path to Kyiv, aside from the Premier derby with Manchester City, but their fans and, more tellingly, their board ,will want to return to the final. It is a link with a glorious past, but this will require investment, starting with a new goalkeeper. Let’s not forget that Liverpool have spent a lot of money to get to this stage. In fact, in the past three years, they’ve paid out almost £ 300 million, although they have recouped almost as much from player sales. Real Madrid, in that timeframe, have spent around half as much. However, Liverpool had just one player (James Milner – 32) over 30 in their starting line-up, whereas Real Madrid had six. This suggests Real Madrid could be entering a period of transition, but as one of the world’s richest clubs and a reputation that’s second to none after four UEFA Champions League titles in five years, they can attract almost anyone. Liverpool will undoubtedly have to work harder to lure the talent they need to turn them into winners rather than nearly men. But where does this Real Madrid side figure in the game’s pantheon? With three consecutive triumphs, and four in five, their haul should place them among the very best. The last teams to win three in a row were Ajax (1971-1973) and Bayern Munich (1974-1976). Real themselves have achieved this feat in the early days of the competition. Somehow, there is not the feeling of celebration about their latest landmark. Perhaps this is attributable to the lack of surprise that generally exists across European football at present. Maybe another Real win, another Spain triumph, induces a collective yawn because predictability is being removed from the sport. Football has thrown Atlético Madrid at them twice in finals, Juventus in 2017 and now Liverpool in 2018. Aside from a penalty shoot-out with Atletico in 2016, their victories have been healthy – 4-1 (2014), 4-1 (2017) and 3-1 (2018). It’s fair to assume that Real know how to handle the big occasion. The competition is part of the club’s DNA (as is the case with Liverpool) and they have the assured attitude that “we know how to do this”. Some might claim that things go Real’s way, but they do because they make sure things move in the right direction for them. Right now, Liverpool, Cairo and FIFA, will be gnashing their teeth at the treatment handed out to Mo Salah, who was dragged to the ground by Sergio Ramos and may miss the World Cup this summer. Ramos, who was described as the “Svengali of white-shirted bastardism” by Guardian writer Barney Ronay, knew what he was doing. He seemed to enjoy Salah’s exit a little too much. The world will miss Salah in Russia if he’s forced out, but again, isn’t this just typical? How often is a major player missing from the World Cup because of an injury setback? On the subject of top men, it almost seemed strange that the evening was lacking a Ronaldo moment, the chance for the six-pack to be bared. It’s never wise to write-off CR7, but we may be seeing the beginning of the end of his Real career. Both Ronaldo and Bale used the occasion to start contract talks, Bale repeatedly reminding Zinedine Zidane that he’s not enjoyed being sidelined, Ronaldo cleverly suggesting that it’s not a foregone conclusion he will be at the club next season. Using the UEFA Champions League final as an advertising hoarding is not really in the spirit of the showpiece, but it does highlight that the people running the game today are the players and their agents, rather than old men of the sea like Florentine Pérez. All said and done, it was a memorable, engaging final – the best of this Real series – and Gareth Bale’s goals have provided the fuel for a speculative summer. Where WILL he play next season? Sad how the poor keeper was abandoned by both his team mates and management. Indeed, was not good. Who would be a keeper?